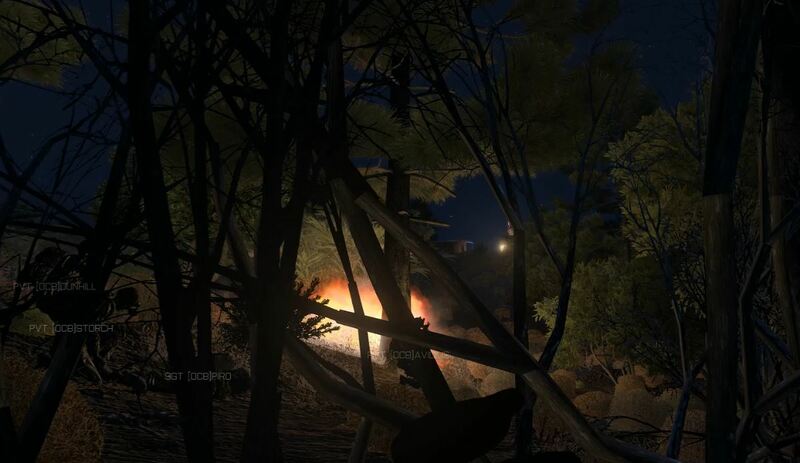 Last night saw OCB land discretely on the shores of Altis to neutralise a Russian held military base and radar facility. As we arrived in submersibles our equipment was sadly lacking for the task. M4 rifles and a few satchel charges to take out a large, active Russian infantry force backed by helicopter transport and armoured vehicles. The element of surprise would be the key. Moving in platoon formation the plan was to use the element of surprise to quickly gain the initiative. Unfortunately contact was taken from intensive Russian infantry patrols. Sections went firm and dealt with contacts as they could. 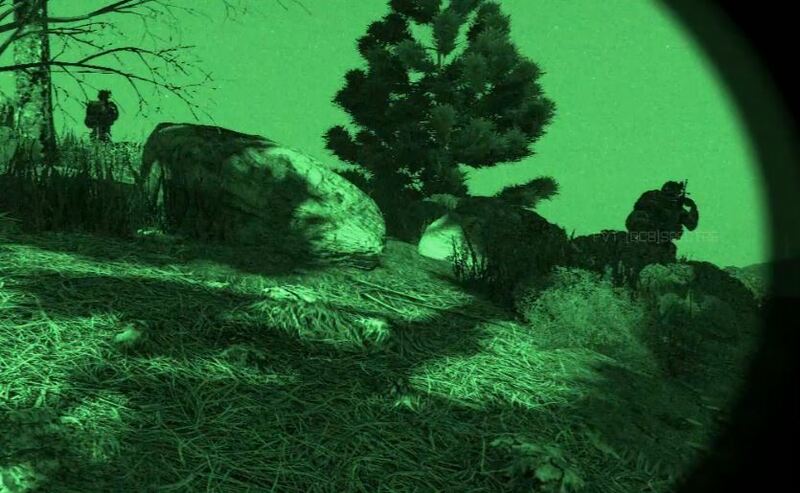 Charlie treating wounded under fire, if you look up the hill you can see enemy flash lights searching for us while an enemy grenade lands behind a tree. 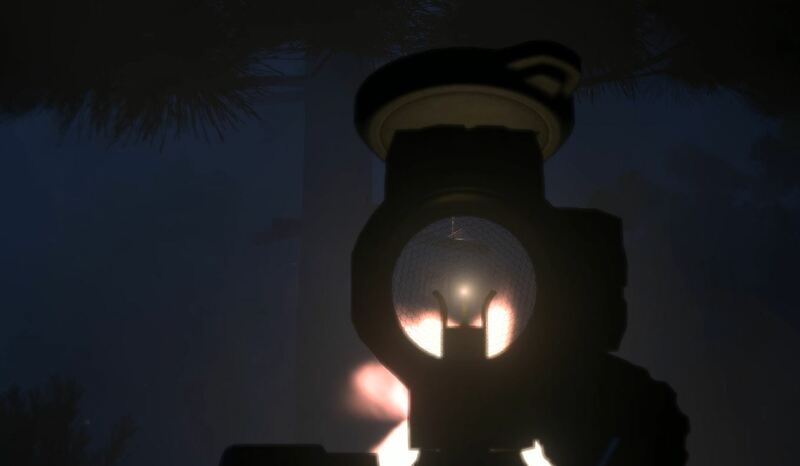 Firing into the glare of an enemy flash light. Without linked ammo, fire suppression was extremely difficult, however our advantage was optics. 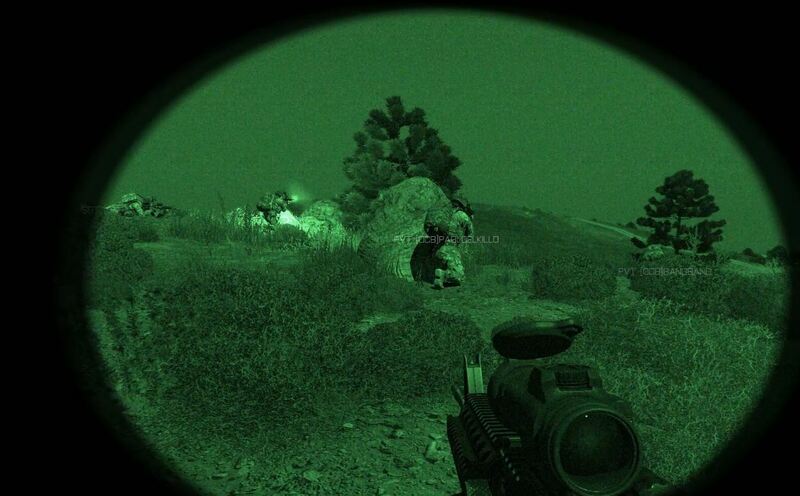 Using NVGs we could PID and engage targets while the enemy were forces to use flash lights to try to find us. After moving into position in the high ground Bravo provided covering fire while Charlie and Delta made their assault. One team covers while the other moves to clear the compound of the Russian military base. 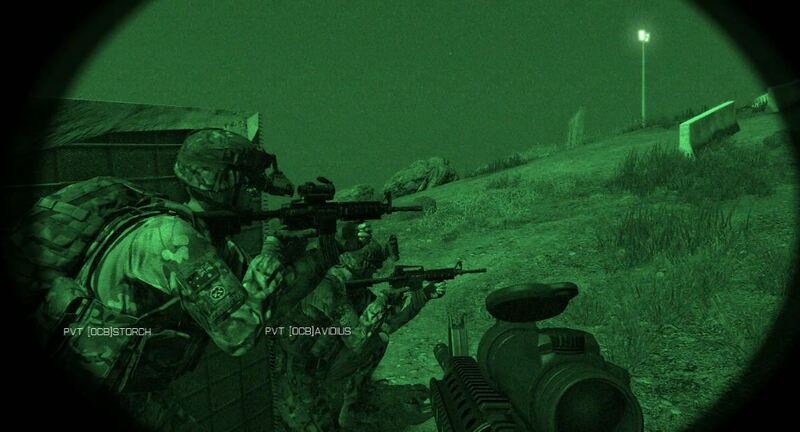 After clearing the military base the platoon swiftly moved off towards the radio dome, our primary target for the night. During our move we successfully avoided contact until we were within 1000m of the objective, after which point a close contact with a patrol was initiated with a hasty ambush. A hasty ambush was conducted on a patrolling section heading down the road, within 100m. After the ambush was successfully completed contacts started errupting from all sides as the enemy transmitted our position and other patrols zero’d in on the platoon. An enemy position contacts us to the rear, firing upon Delta. Command moves in from the right flank. The Command Team flank and eliminate the two man position with rifle fire, followed by grenades. Once the contacts were dealt with we broke contact and moved to the vicinity of the objective with the same execution in mind. Sections would use opposing peaks to lay down covering fire while another section lead the assault with grenades and riflefire. Setting an OP over the radar dome. An enemy eight man patrol casually walking right up on the Platoon. A section assaults up the hill to the Radar Complex. After hectic firefights that included counter attacks from patrols called in from the surrounding region the platoon finally took the complex.